The spirit of enjoying life is evident in this chic and stylish masterpiece. 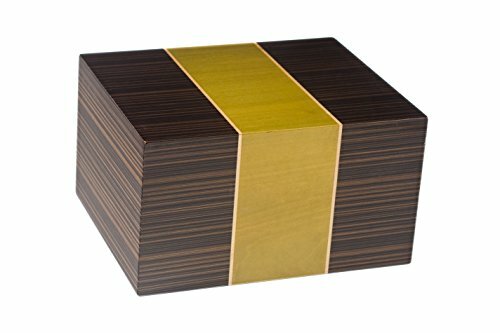 This wood urn is crafted from ebony wood with a luxurious inlay. The clean and classic lines of this design coordinate with any decor. Interior is velvet lined so that a temporary urn will fit comfortably inside. Comes packaged in a velvet bag to protect the finish. This is a large size wood urn and is the perfect funeral/memorial urn that fits up to 235 cu inches (up to 225 lbs. ).